Episode 36: The Pajama Game (Fossepocalypse #3) Part 1 - A Reel Education: The Musical! Not pictured: bare-chested John Raitt. Jazz hams, the Fossepocalypse continues with the oft-overlooked, and amazingly entertaining THE PAJAMA GAME! As we discuss in this episode, the dances created here actually predate MY SISTER EILEEN. It was his work on THE PAJAMA GAME that got him the job on EILEEN, in fact! 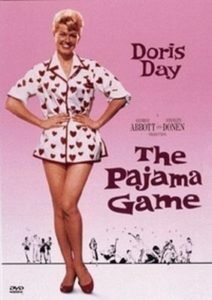 But the movie version of PAJAMA GAME came after. Fosse’s signature style is still in development, but when it appears (“Steam Heat”) it is unmistakable. This is sadly the only film record we have of Carol Haney’s Tony-winning performance, and her only film speaking role. She was a singular talent: an amazing dancer and a brilliant comedienne. The Broadway legend John Raitt also gives his one-and-only screen performance, using his manly chest and sublime voice to woo the sassy Babe Williams (Doris Day). Vinnie and Mike fell so much in love with this movie – and Windy had so many great tidbits to share – that this episode ends up being a two-parter. It may be our “Once a Year Day” but we’ll have it twice – tune in next week for part two!